In 2012 hate motivated crime has gained the attention of many EU, state and civil society actors and initiatives. The rapid rise of xenophobic, islamophobic and homophobic extremism in the public and political sphere has been acknowledged and the need to defend the European society from threats to its social cohesion and the need to promote equal participation are key themes of the current volatile and transitional era for the Union. The RED Network contributed a considerable effort in the previous years to highlight how such phenomena threat to undermine modern European democracies and to disenfranchise European peoples from their citizen rights and alienate them from core values and fundamental democratic principles of the EU. 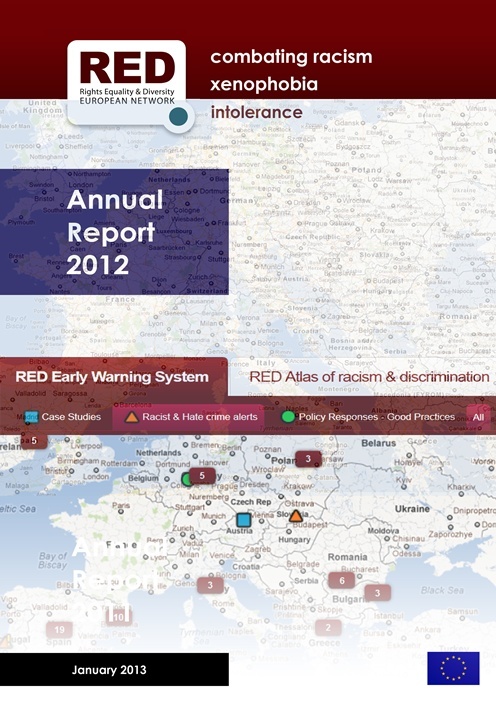 The RED Network publishes today the second Annual Report of the RED Early Warning System and The Atlas of Racism, Equality and Discrimination, a unique monitoring on line tool that is powerful, empowering and independent. The carefully selected information provided by the RED Early Warning System and the Atlas of Racism, Equality & Discrimination aims at providing a paradigm for improving monitoring and reporting on racism and discrimination in EU countries. Data collected and published in a highly interactive manner through a user-oriented web portal concern the current state of things regarding the legislation, the policies, the structures and mechanisms or their implementation, as well as the actual outcomes and impact achieved. Aims at throwing light and revealing the real picture of the situation regarding these worrying phenomena in the EU.